The album still doesn't have a name and is overdue according to Billboard, but U2 said their priority was to make sure it was right. 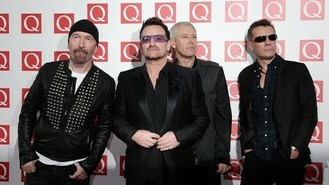 Bono said: "The album won't be ready till it's ready. But right now, people are walking a little differently - well, they're not walking, they're running as if to a finish line. "There's a couple of songs that are part of the story we haven't quite finished. We know we have to spend a couple of years taking these songs around the world, so they'd better be good." The Edge added: "We don't want to ever be a heritage act. It might happen, but we'll go kicking and screaming into that mode. We feel the place for us to be is part of the conversation of contemporary culture and music and film and everything else, and we don't see the reason why we can't, because it's been possible for various artists in different forms. "Frank Lloyd Wright, to the day he died, was designing the most incredible things - we want to be part of that rather than grow old gracefully." Larry Mullen hinted that the album could include a few collaborations when it is released. He said: "We've always needed collaborators to challenge us. We're slow learners. We need to be creative, on the cutting edge, challenged, and it's really hard going, it's relentless, and we're relentless, and we have a history of breaking engineers, producers. "I mean, people come out of working with U2 and just go, 'I just don't know what's happened; it feels like a lifetime has passed by.' And that's just the way we work."